From 1861 to 1865 the Confederate States of America had a federal government modeled on that of the United States of America from which its member states had seceded to establish and independent country. 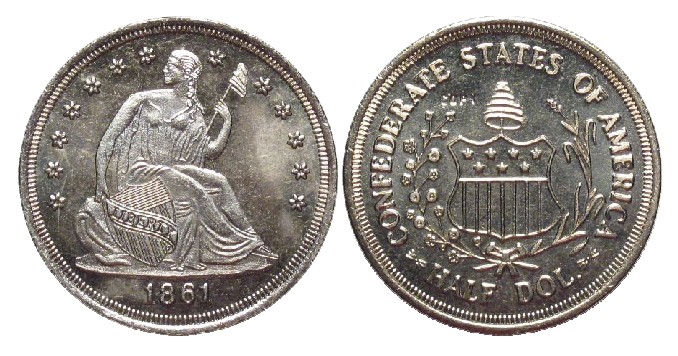 Formed in February 1861, the Confederate States of America was a independent republic composed of 11 states that seceded from the United States of America in 1860-1861, to preserve the economic enslavement of African descent people, states’ rights, and political liberty for European descent people. The Confederate States of America carried on all the affairs of a separate independent nation and government and conducted a major war against the United States of America until defeated in the spring of 1865. Thus, the national and battle flags of the Confederate States of America actually represent an enemy nation of the United States of America. Something to think about. Explore a brief historical flashback of the independent republic known as the Confederate States of America. Europe’s conquest and colonization of North America, South America and the Caribbean islands from the 15th century (1400s) onward created an insatiable demand for African laborers, who were deemed more fit to work in the tropical conditions of the New World. A letter from Spanish monarchs Ferdinand and Isabel to Nicolas Ovando allowing enslaved people of African descent to be imported to Hispaniola (present day Dominican Republic and Haiti), September 16, 1501, courtesy of the Archivo General de Indias, Sevilla, Spain. The monarchs reasoned that recent converts, heretics, and peoples of other religions (Muslims, Jews, or Christian Protestants) would harm the Native of Americans’ conversion to Christian Catholicism. The monarchs therefore banned North African black Moors from being transported to the New World. 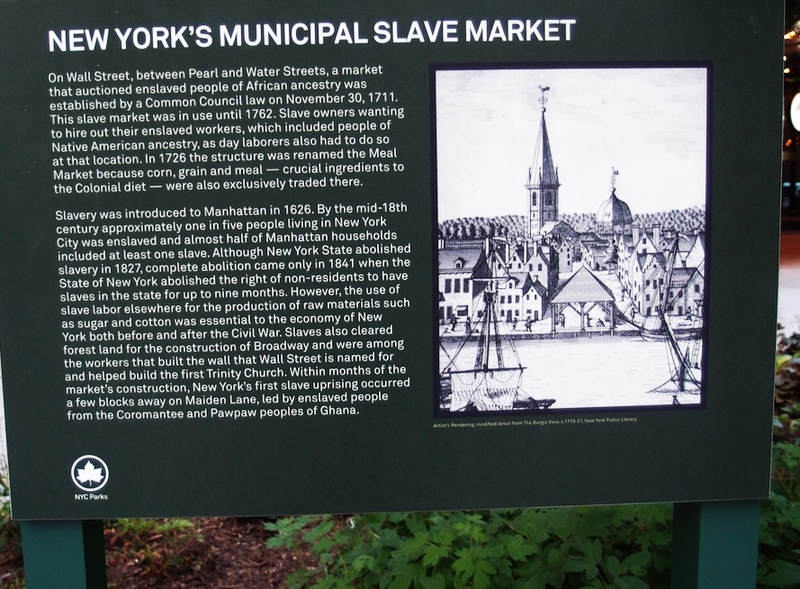 However, they permitted enslaved people of African descent provided that they were born in Spain. 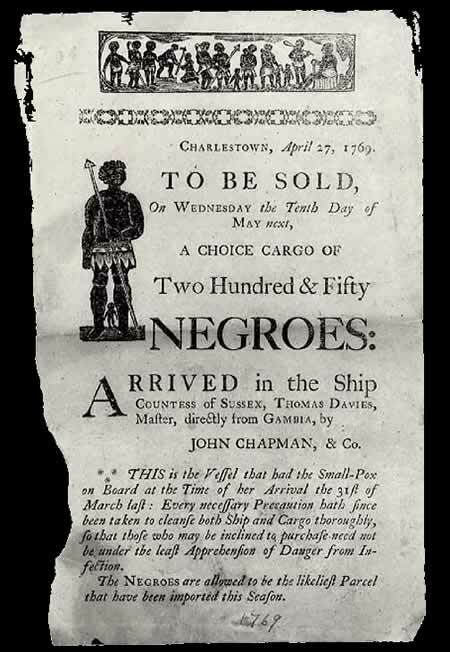 This is the first known example of Europeans transporting enslaved blacks across the Atlantic to work in the New World. 1502 is the first report of enslaved Africans in the Americas. During the 1590s, the Dutch challenged the Portuguese monopoly to become the main slave trading nation. Slavery had been illegal in Britain since 1102, but there were no laws to stop the use of enslaved people to toil in the fields and plantations of the growing British Empire. In the 1930s, the Works Progress Administration (WPA) sponsored a federal project dedicated to chronicling the experience of slavery as remembered by formerly enslaved African descent people and their descendants. 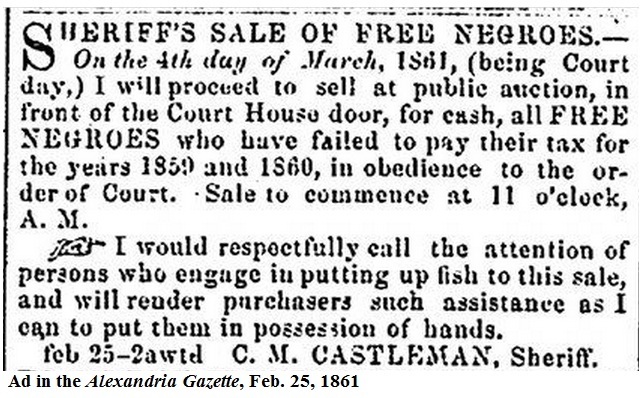 For cash, all FREE NEGROES who have failed to pay their tax for the years 1859 and 1860. On February 4,1861, the Confederacy open for business when the Provisional Confederate Congress convened in Montgomery, Alabama. The first order of business was drafting a constitution. The congress used the U.S. Constitution as a model,taking most of itverbatim. In just four days, a tentative document to govern the new nation was hammered out. The president was limited to one six-year term. Unlike the U.S. Constitution, the word “slave” was used and the institution protected in all states and any territories to be added later. 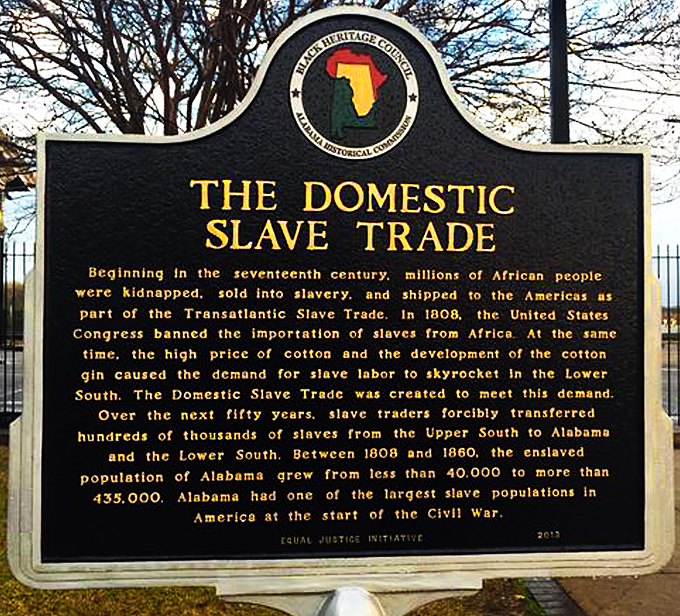 Importation of slaves was prohibited, as this would alienate European nations and would detract from the profitable “internal slave trade” in the South. Other components of the constitution were designed to enhance the power of the states–governmental money for internal improvements was banned and the president was given a line-item veto on appropriations bills. 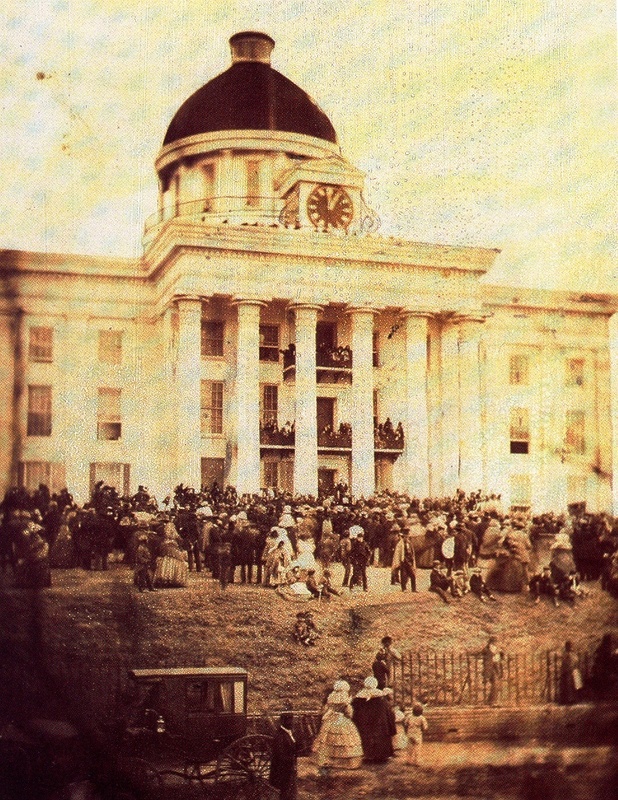 The Alabama State Capitol served as the capitol of the Confederate States of America until May 26, 1861, when the capital was relocated to Richmond, Virginia. 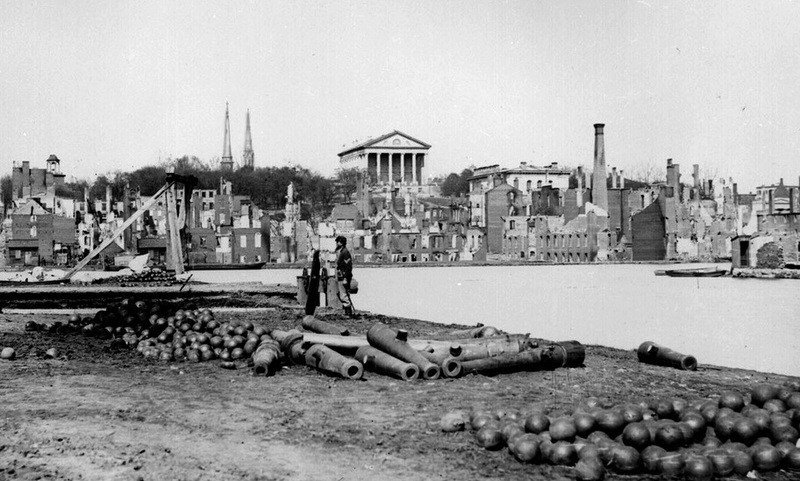 When Virginia adopted a secession ordinance soon after the attack on Fort Sumter, Richmond quickly became the front runner to be the national capital. 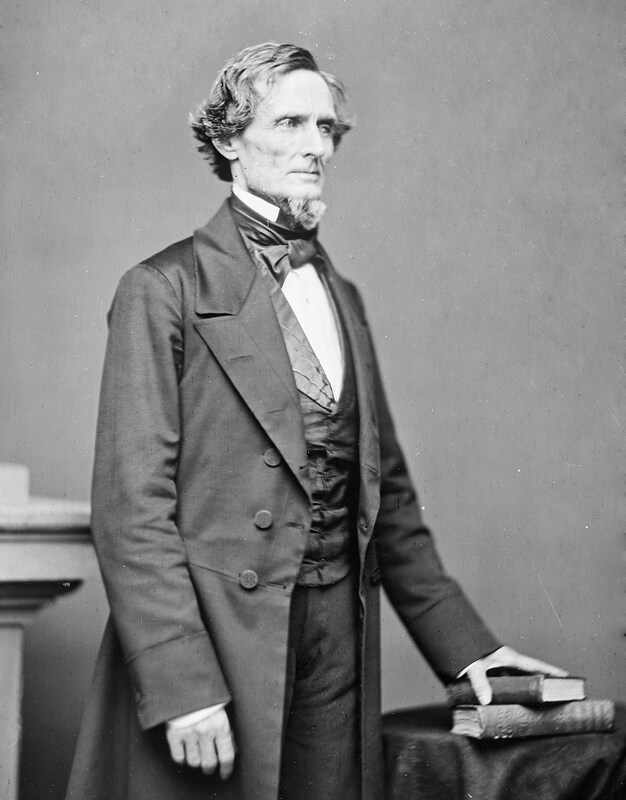 Richmond had already been a candidate, much to the disappointment of some in the Lower South, who resented the idea of moving the seat of government, from Montgomery, to a state where there had been considerable opposition to joining the Confederacy. The so-called “Cotton States” had been the first to leave the Union, and they maintained that a “Cotton Confederacy” should have its capital there. The Alabama state convention even offered to establish a 10-square-mile federal district, like the District of Columbia, if the capital remained in the state. The case for Virginia’s state capital was overwhelming, though: it was far larger than Montgomery and could provide whatever accommodations a national capital needed. 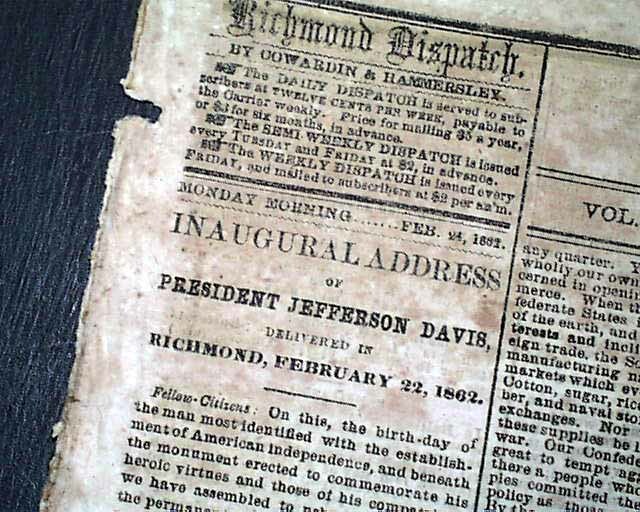 A bill to change the seat of government to Richmond was introduced in the Confederate Congress on May 1. Meeting in secret, the provisional Congress debated moving the capital. 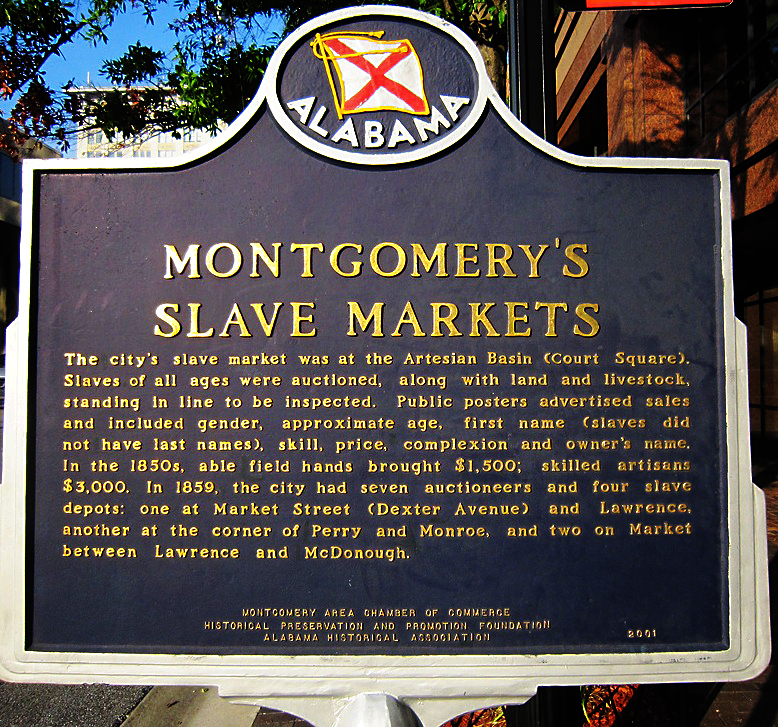 By this time, the oppressive May heat and swarming mosquitoes had convinced many that they could not remain in Montgomery. Ten days later, they approved a resolution to adjourn the Congress on May 23 and meet in Richmond in July, unless the president decided on a different time and place. However, President Davis vetoed the resolution, saying the legislative and executive branches should not meet in different places. After more debate, a resolution to move the entire government to Richmond was put forth. The measure passed by a vote of 6-3 (Alabama, Mississippi and South Carolina voted no). President Davis signed the resolution and Congress appropriated $40,000 to pay the cost of moving. More significantly, by locating the Southern capital so close to Washington and the North, the Confederacy essentially doomed Virginia to constant warfare. Sec. 2. 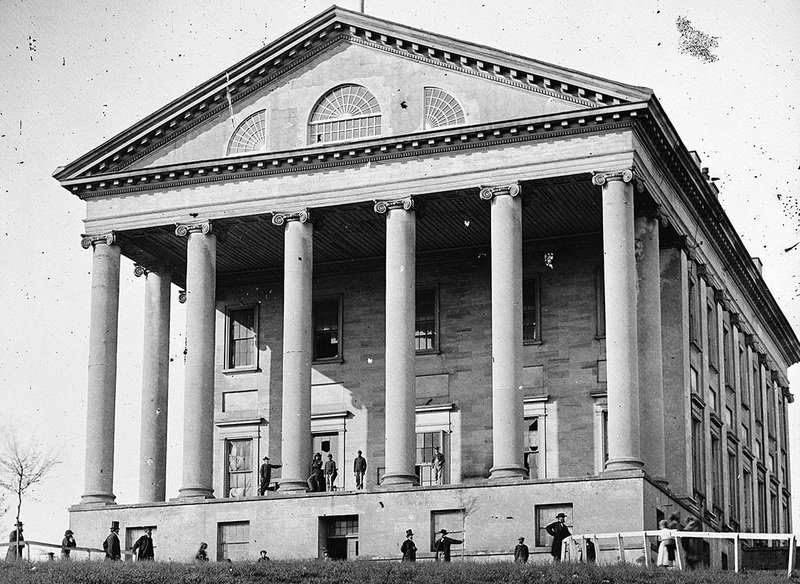 (I) The House of Representatives shall be composed of members chosen every second year by the people of the several States; and the electors in each State shall be citizens of the Confederate States, and have the qualifications requisite for electors of the most numerous branch of the State Legislature; but no person of foreign birth, not a citizen of the Confederate States, shall be allowed to vote for any officer, civil or political, State or Federal. 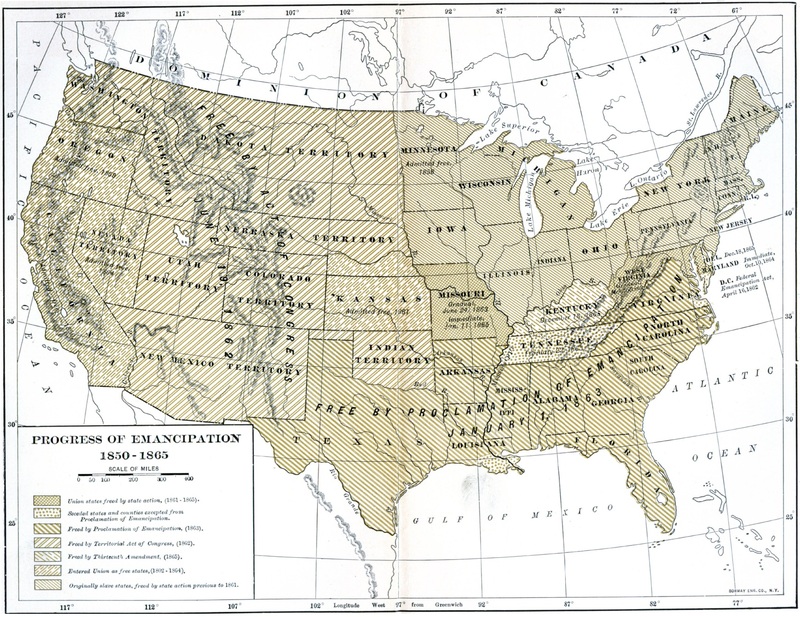 (3) Representatives and direct taxes shall be apportioned among the several States, which may be included within this Confederacy, according to their respective numbers, which shall be determined by adding to the whole number of free persons, including those bound to service for a term of years, and excluding Indians not taxed, three-fifths of all slaves. The actual enumeration shall be made within three years after the first meeting of the Congress of the Confederate States, and within every subsequent term of ten years, in such manner as they shall by law direct. The number of Representatives shall not exceed one for every fifty thousand, but each State shall have at least one Representative; and until such enumeration shall be made, the State of South Carolina shall be entitled to choose six; the State of Georgia ten; the State of Alabama nine; the State of Florida two; the State of Mississippi seven; the State of Louisiana six; and the State of Texas six. Sec. 3. (I) The Senate of the Confederate States shall be composed of two Senators from each State, chosen for six years by the Legislature thereof, at the regular session next immediately preceding the commencement of the term of service; and each Senator shall have one vote. Sec. 4. 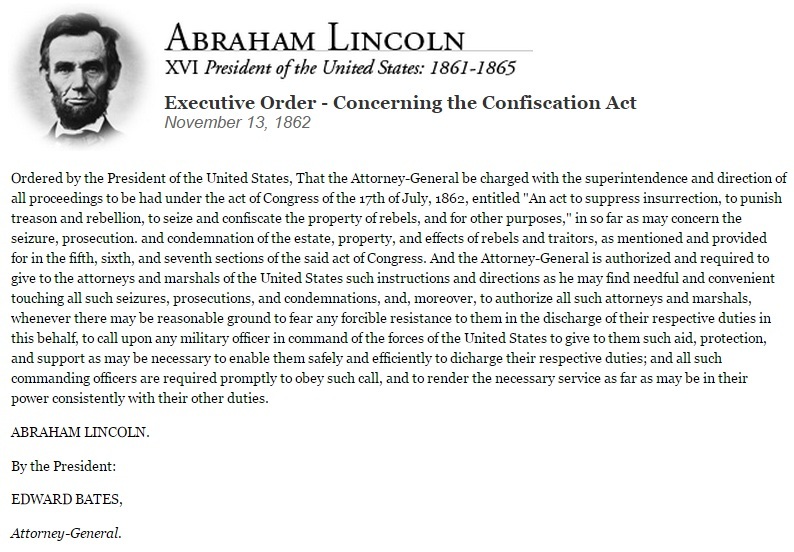 (I) The times, places, and manner of holding elections for Senators and Representatives shall be prescribed in each State by the Legislature thereof, subject to the provisions of this Constitution; but the Congress may, at any time, by law, make or alter such regulations, except as to the times and places of choosing Senators. Sec. 5. (I) Each House shall be the judge of the elections, returns, and qualifications of its own members, and a majority of each shall constitute a quorum to do business; but a smaller number may adjourn from day to day, and may be authorized to compel the attendance of absent members, in such manner and under such penalties as each House may provide. Sec. 6. (I) The Senators and Representatives shall receive a compensation for their services, to be ascertained by law, and paid out of the Treasury of the Confederate States. They shall, in all cases, except treason, felony, and breach of the peace, be privileged from arrest during their attendance at the session of their respective Houses, and in going to and returning from the same; and for any speech or debate in either House, they shall not be questioned in any other place. 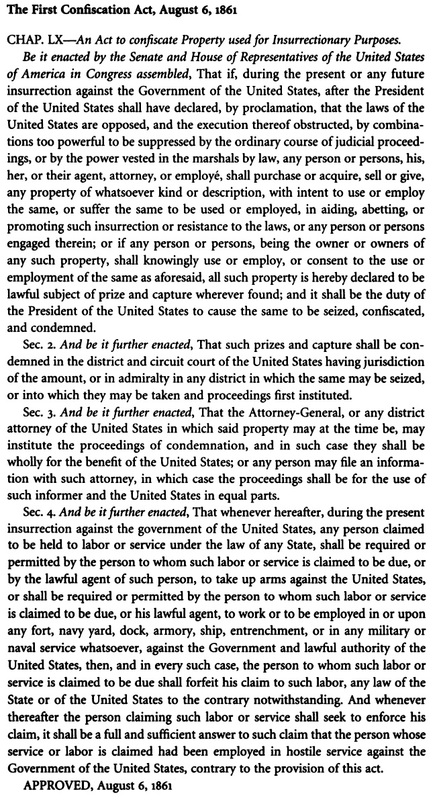 ‘o Senator or Representative shall, during the time for which he was elected, be appointed to any civil office under the authority of the Confederate States, which shall have been created, or the emoluments whereof shall have been increased during such time; and no person holding any office under the Confederate States shall be a member of either House during his continuance in office. But Congress may, by law, grant to the principal officer in each of the Executive Departments a seat upon the floor of either House, with the privilege of discussing any measures appertaining to his department. Sec. 7. (I) All bills for raising revenue shall originate in the House of Representatives; but the Senate may propose or concur with amendments, as on other bills. Sec. 10. (I) No State shall enter into any treaty, alliance, or confederation; grant letters of marque and reprisal; coin money; make anything but gold and silver coin a tender in payment of debts; pass any bill of attainder, or ex post facto law, or law impairing the obligation of contracts; or grant any title of nobility. Sec. 2. 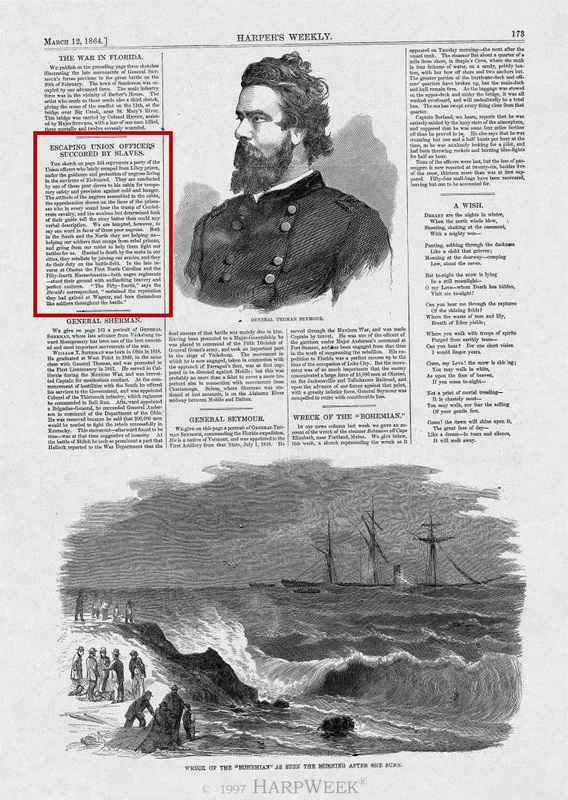 (I) The President shall be Commander-in-Chief of the Army and Navy of the Confederate States, and of the militia of the several States, when called into the actual service of the Confederate States; he may require the opinion, in writing, of the principal officer in each of the Executive Departments, upon any subject relating to the duties of their respective offices; and he shall have power to grant reprieves and pardons for offenses against the Confederate States, except in cases of impeachment. Sec. 3. (I) The President shall, from time to time, give to the Congress information of the state of the Confederacy, and recommend to their consideration such measures as he shall judge necessary and expedient; he may, on extraordinary occasions, convene both Houses, or either of them; and in case of disagreement between them, with respect to the time of adjournment, he may adjourn them to such time as he shall think proper; he shall receive ambassadors and other public ministers; he shall take care that the laws be faithfully executed, and shall commission all the officers of the Confederate States. Section I. (I) The judicial power of the Confederate States shall be vested in one Supreme Court, and in such inferior courts as the Congress may, from time to time, ordain and establish. The judges, both of the Supreme and inferior courts, shall hold their offices during good behavior, and shall, at stated times, receive for their services a compensation which shall not be diminished during their continuance in office. Sec. 2. 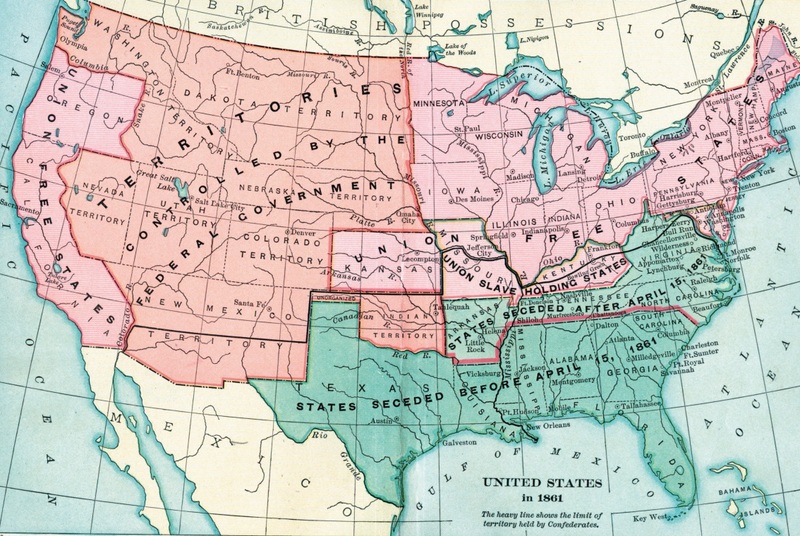 (I) The judicial power shall extend to all cases arising under this Constitution, the laws of the Confederate States, and treaties made, or which shall be made, under their authority; to all cases affecting ambassadors, other public ministers and consuls; to all cases of admiralty and maritime jurisdiction; to controversies to which the Confederate States shall be a party; to controversies between two or more States; between a State and citizens of another State, where the State is plaintiff; between citizens claiming lands under grants of different States; and between a State or the citizens thereof, and foreign states, citizens, or subjects; but no State shall be sued by a citizen or subject of any foreign state. Sec. 3. 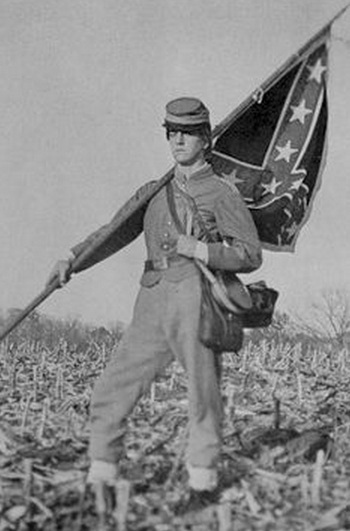 (I) Treason against the Confederate States shall consist only in levying war against.them, or in adhering to their enemies, giving them aid and comfort. No person shall be convicted of treason unless on the testimony of two witnesses to the same overt act, or on confession in open court. Section I. (I) Full faith and credit shall be given in each State to the public acts, records, and judicial proceedings of every other State; and the Congress may, by general laws, prescribe the manner in which such acts, records, and proceedings shall be proved, and the effect thereof. Sec. 3. (I) Other States may be admitted into this Confederacy by a vote of two-thirds of the whole House of Representatives and two-thirds of the Senate, the Senate voting by States; but no new State shall be formed or erected within the jurisdiction of any other State, nor any State be formed by the junction of two or more States, or parts of States, without the consent of the Legislatures of the States concerned, as well as of the Congress. Section I. (I) Upon the demand of any three States, legally assembled in their several conventions, the Congress shall summon a convention of all the States, to take into consideration such amendments to the Constitution as the said States shall concur in suggesting at the time when the said demand is made; and should any of the proposed amendments to the Constitution be agreed on by the said convention, voting by States, and the same be ratified by the Legislatures of two- thirds of the several States, or by conventions in two-thirds thereof, as the one or the other mode of ratification may be proposed by the general convention, they shall thenceforward form a part of this Constitution. But no State shall, without its consent, be deprived of its equal representation in the Senate. Fellow-Citizens: On this the birthday of the man most identified with the establishment of American independence, and beneath the monument erected to commemorate his heroic virtues and those of his compatriots, we have assembled to usher into existence the Permanent Government of the Confederate States. Through this instrumentality, under the favor of Divine Providence, we hope to perpetuate the principles of our revolutionary fathers. The day, the memory, and the purpose seem fitly associated. …. ….For proof of the sincerity of our purpose to maintain our ancient institutions, we may point to the Constitution of the Confederacy and the laws enacted under it, as well as to the fact that through all the necessities of an unequal struggle there has been no act on our part to impair personal liberty or the freedom of speech, of thought, or of the press. The courts have been open, the judicial functions fully executed, and every right of the peaceful citizen maintained as securely as if a war of invasion had not disturbed the land. The people of the States now confederated became convinced that the Government of the United States had fallen into the hands of a sectinal majority, who would pervert that most sacred of all trusts to the destruction of the rights which it was pledged to protect. They believed that to remain longer in the Union would subject them to a continuance of a disparaging discrimination, submission to which would be inconsistent with their welfare, and intolerable to a proud people. They therefore determined to sever its bonds and establish a new Confederacy for themselves. …. ….True to our traditions of peace and our love of justice, we sent commissioners to the United States to propose a fair and amicable settlement of all questions of public debt or property which might be in dispute. But the Government at Washington, denying our right to self-government, refused even to listen to any proposals for a peaceful separation. Nothing was then left to do but to prepare for war. …. In 1861 the Confederate Provisional Congress passed a number of laws to create a national army. 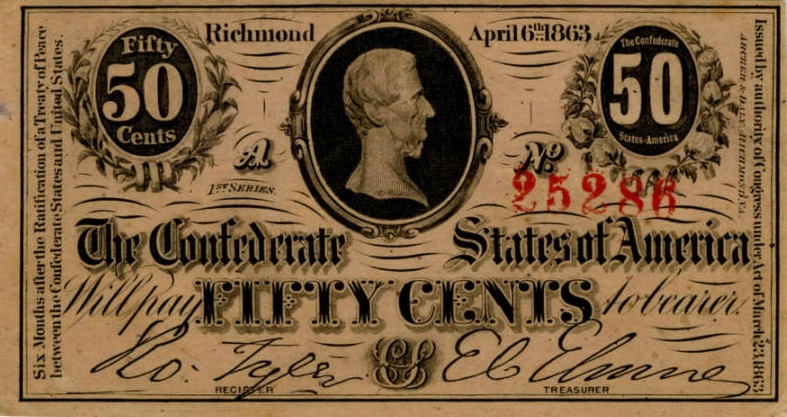 The Congress of the Confederate States of America do enact, That the Secretary of the Treasury be and he is hereby authorized to issue, in addition to the amounts heretofore authorized to be issued, three millions five hundred thousand dollars of Confederate States bonds, under the provisions and conditions of the Act entitled “An Act to authorize the issue of Treasury notes, and to provide a war tax for their redemption,” approved August nineteenth, eighteen hundred and sixty-one, and by the further supplemental Act to the above cited Act, approved December nineteenth, eighteen hundred and sixty-one, to meet a contract made by the Secretary of the Navy for six iron-clad vessels of war and six steam engines and boilers complete, to be constructed abroad, and said bonds, when issued, shall be delivered to the persons entitled to them under the above recited contract. 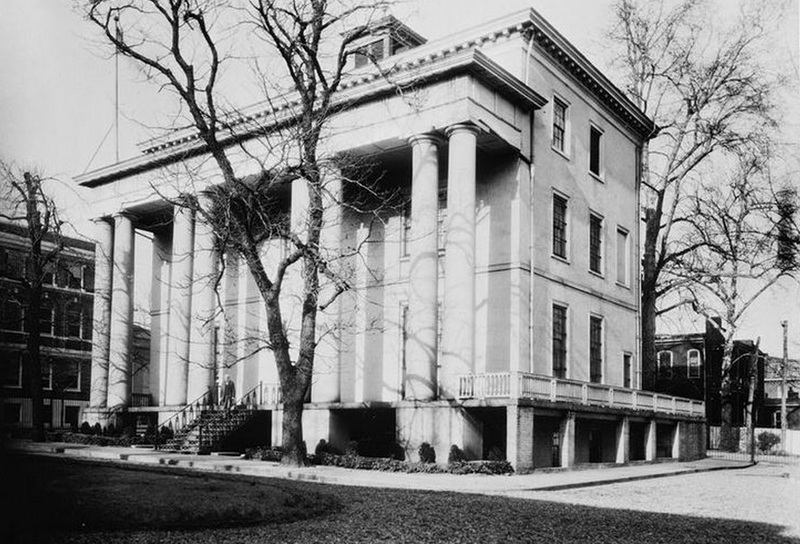 When the Civil War began, each of the U.S. Mint branch facilities of: New Orleans, Louisiana, Charlotte, North Carolina, and Dahlonega, Georgia were seized and closed. 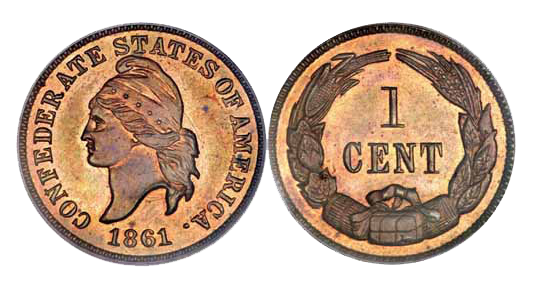 The newly independent Confederate States of America reopened these mint locations for the production of confederate money. 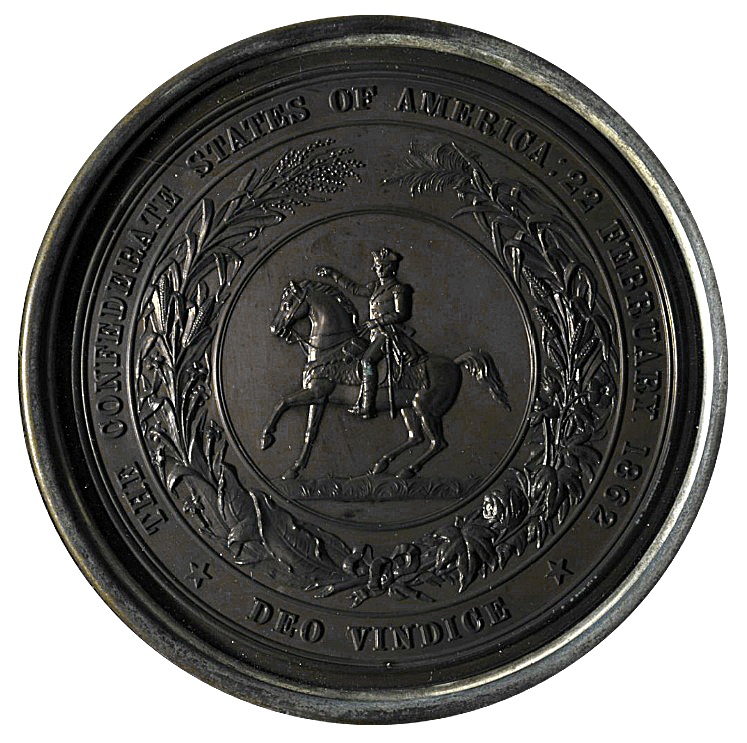 When the three branches were originally established by United States Mint, the New Orleans branch produced coins made of gold and silver, the Charlotte and Dahlonega facilities minted only gold coins. The production facility in New Orleans was the first of the three Southern branch Mints to be controlled by the Confederacy, first by the State of Louisiana on January 31, 1861, and later by the federal government of the Confederate States of America. On April 8, 1861, the Dahlonega facility was claimed, followed by the Charlotte facility on April 20, 1861. 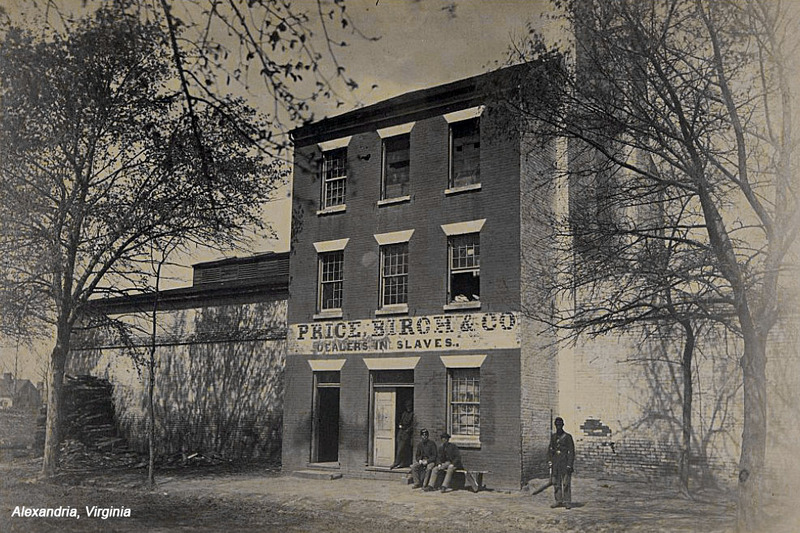 After the facilities were seized, coining operations was sporadic until all mandated functions ceased and were later converted to assaying functions by Acts approved by the Congress of the Confederacy. At the height of the Civil War, the United States of America’s Act of 1863 created a branch Mint in Carson City, Nevada to handle the enormous amount of silver that was being pulled from the mines in Nevada. 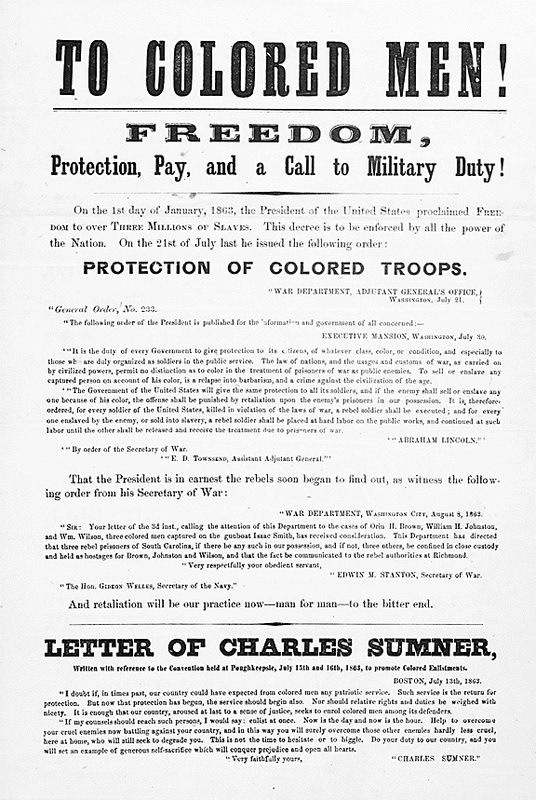 The issues of emancipation and military service were intertwined from the onset of the Civil War. 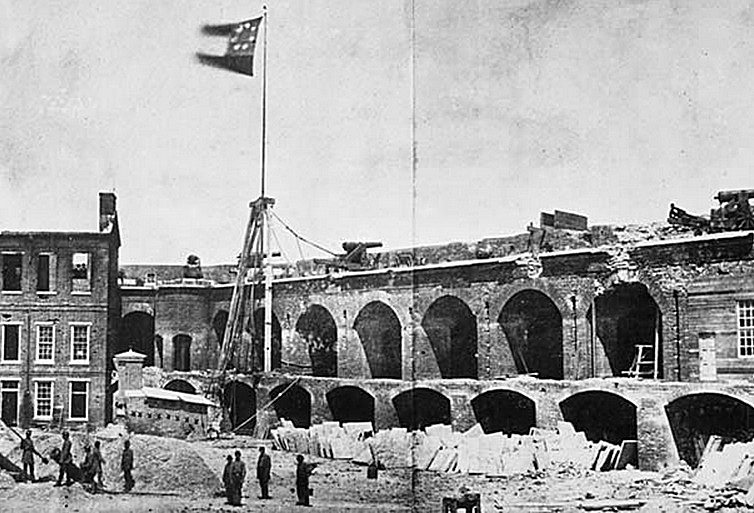 News from Fort Sumter set off a rush by free black men to enlist in U.S. military units. They were turned away, however, because a Federal law dating from 1792 barred Negroes from bearing arms for the U.S. army (although they had served in the American Revolution and in the War of 1812). 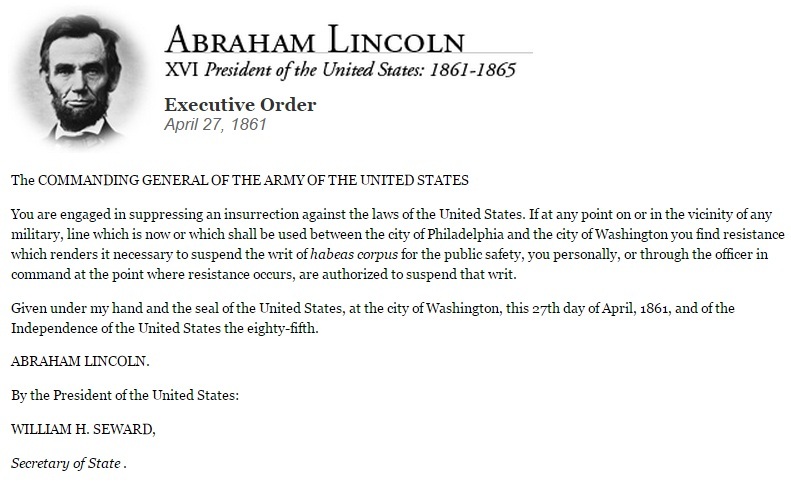 The Lincoln administration wrestled with the idea of authorizing the recruitment of black troops, concerned that such a move would prompt the border states to secede. When Gen. John C. Frémont in Missouri and Gen. David Hunte in South Carolina issued proclamations that emancipated enslaved Africans in their military regions and permitted them to enlist, their superiors sternly revoked their orders. 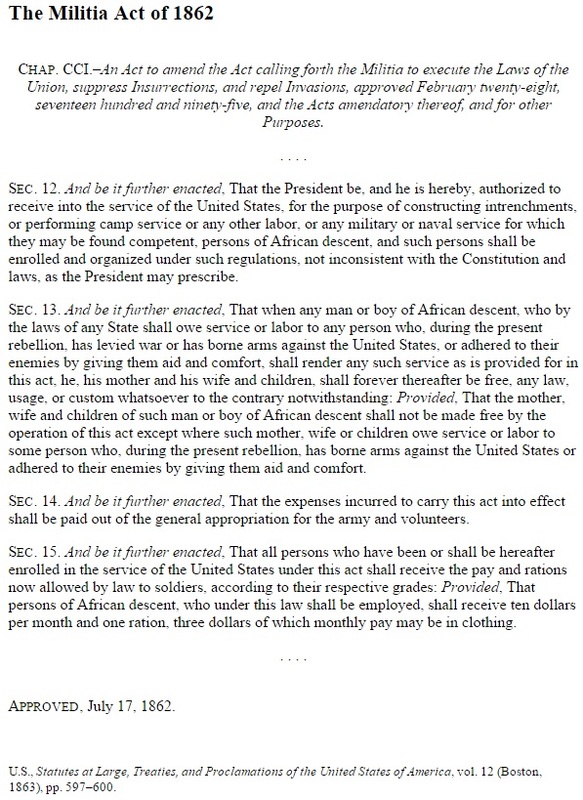 By mid-1862, however, the escalating number of former enslaved people of African descent (contrabands), the declining number of white volunteers, and the increasingly pressing personnel needs of the Union Army pushed the United States of America government into reconsidering the ban. 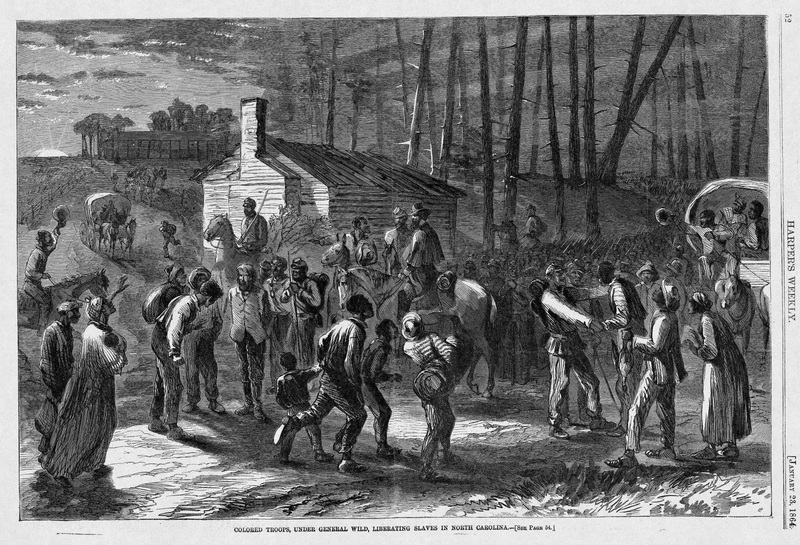 As a result, on July 17, 1862, the United States Congress passed the Second Confiscation and Militia Act, freeing enslaved people who had masters in the Confederate States Army. Two days later, slavery was abolished in the territories of the United States, and on July 22 President Lincoln presented the preliminary draft of the Emancipation Proclamation to his Cabinet. 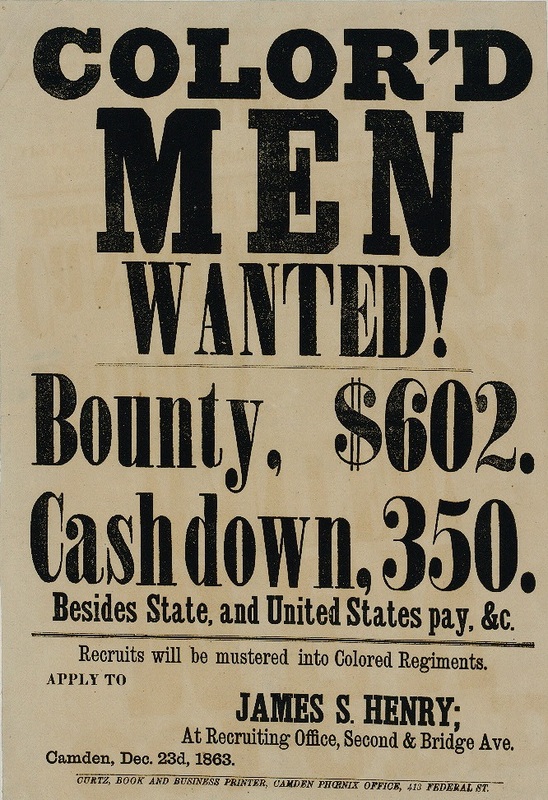 After the Union Army turned back Lee’s first invasion of the North at Antietam, Maryland, and the Emancipation Proclamation was subsequently announced, black recruitment was pursued in earnest. Volunteers from South Carolina, Tennessee, and Massachusetts filled the first authorized black regiments. Recruitment was slow until black leaders such as Frederick Douglass encouraged black men to become soldiers to ensure eventual full citizenship. 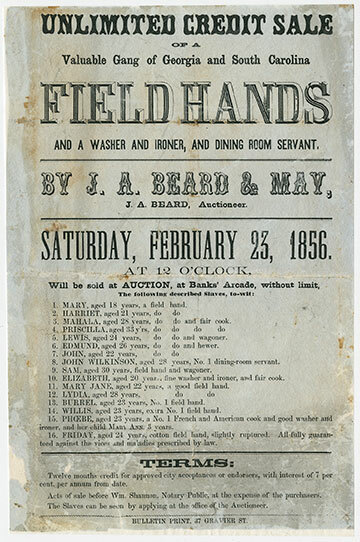 Volunteers began to respond, and in May 1863 the Government established the Bureau of Colored Troops to manage the burgeoning numbers of black soldiers. 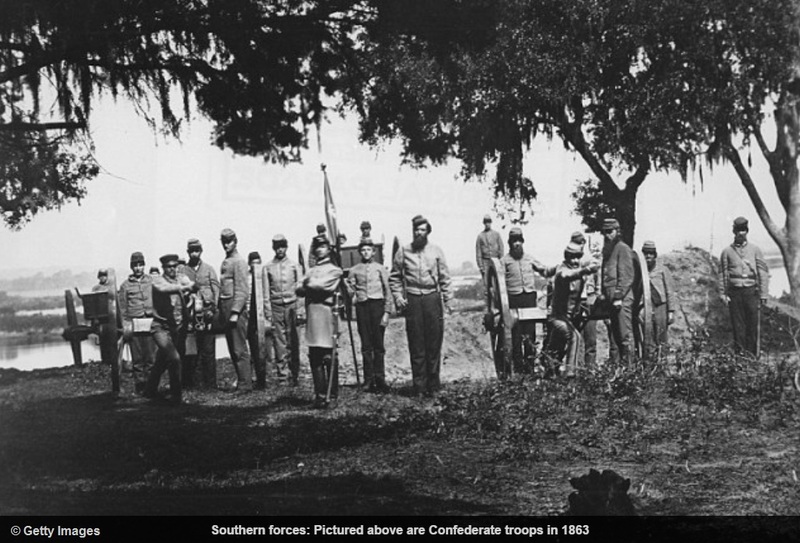 On March 13, 1865, with the main Confederate States of America armies facing long odds against must larger United States of America armies, the Confederacy, in a desperate measure,reluctantly approves the use of black troops. 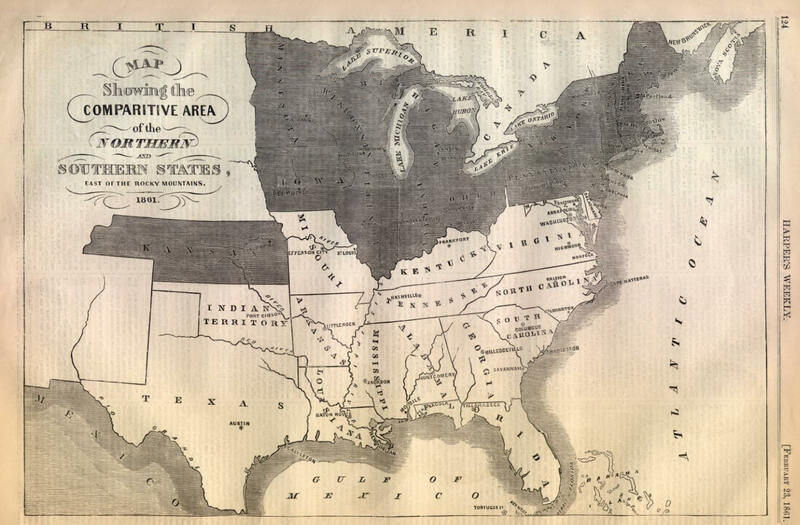 The situation was bleak for the Confederate States of America in the spring of 1865. 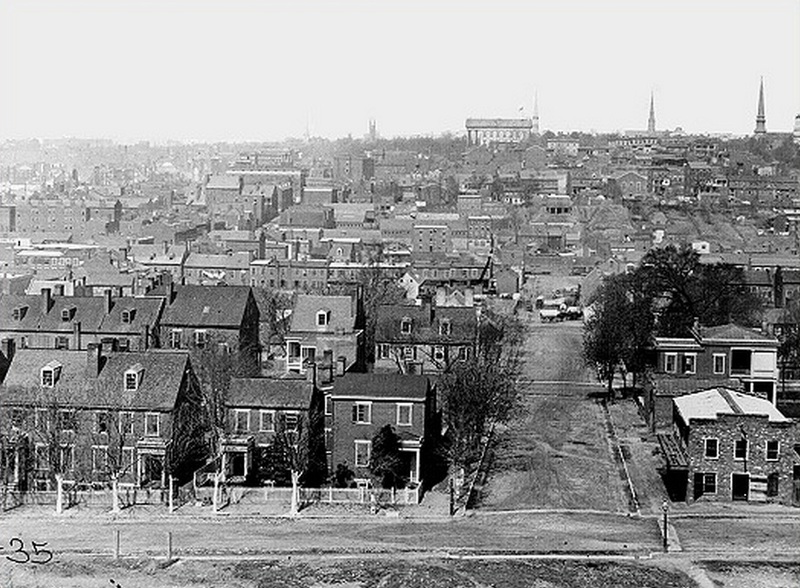 The United States of America had captured large swaths of Southern territory, General William T. Sherman’s Union army was tearing through North Carolina and South Carolina, and General Robert E. Lee was trying valiantly to hold the Confederate national capital of Richmond, Virginia, against General Ulysses S. Grant’s growing force. Robert E. Lee and Confederate President Jefferson Davis had only two options. One was for Robert E. Lee to unite with General Joseph Johnston’s army in the Carolinas and use the combined force to take on the American’s Sherman and Grant one at a time. The other option was to arm enslaved people of African descent, the last source of fresh manpower in the Confederacy. 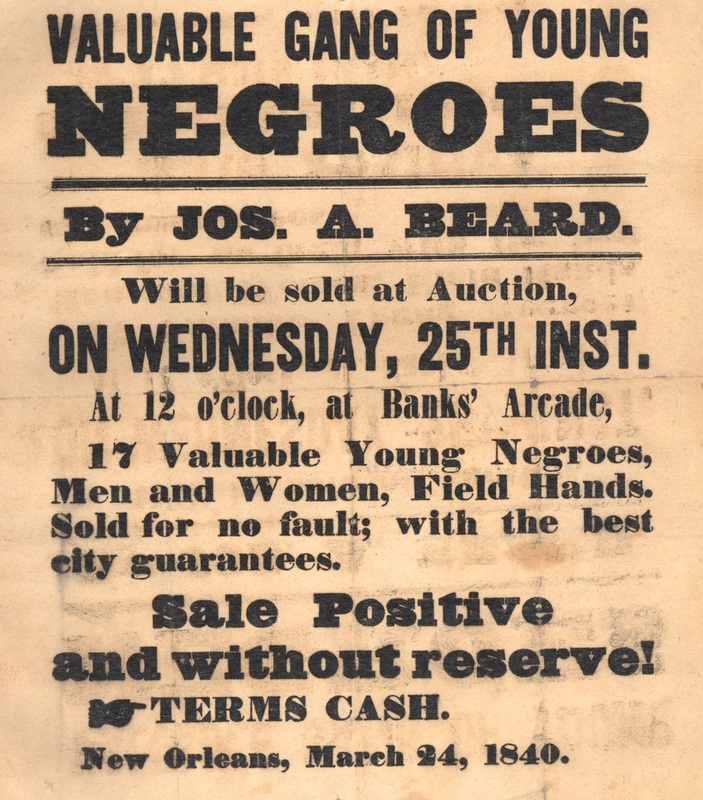 The idea of enlisting blacks had been debated for some time. Arming slaves was essentially a way of setting them free, since they could not realistically be sent back to plantations after they had fought. General Patrick Cleburne had suggested enlisting slaves a year before, but few in the Confederate leadership considered the proposal, since slavery was the foundation of Southern society. 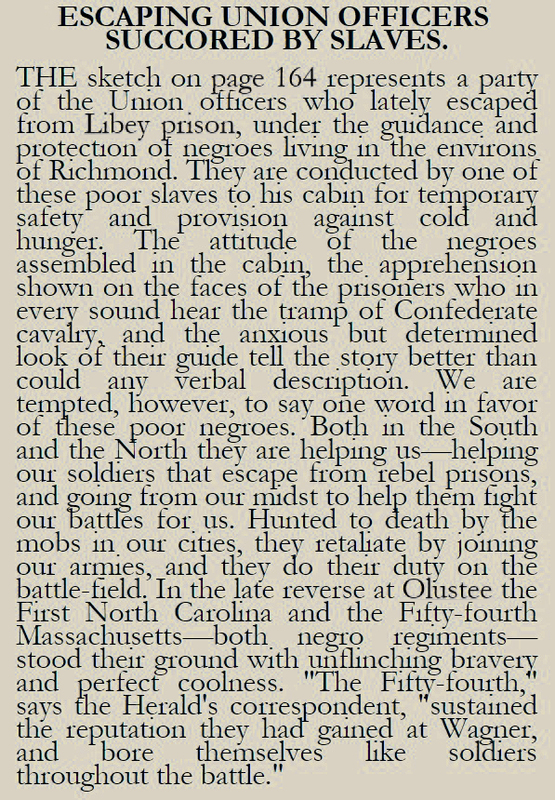 One politician asked, “What did we go to war for, if not to protect our property?” Another suggested, “If slaves will make good soldiers, our whole theory of slavery is wrong.” Lee weighed in on the issue and asked the Confederate government for help. 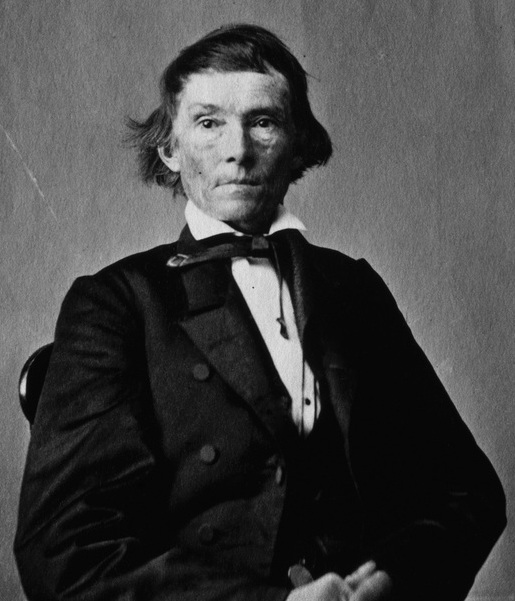 “We must decide whether slavery shall be extinguished by our enemies and the slaves be used against us, or use them ourselves.” Lee asked that the slaves be freed as a condition of fighting, but the bill that passed the Confederate Congress on March 13, 1865,did not stipulate freedom for those who served. Several thousand blacks were enlisted in the Confederate States of America cause, but they could not begin to balance out the nearly 200,000 blacks who fought for the United States of America. 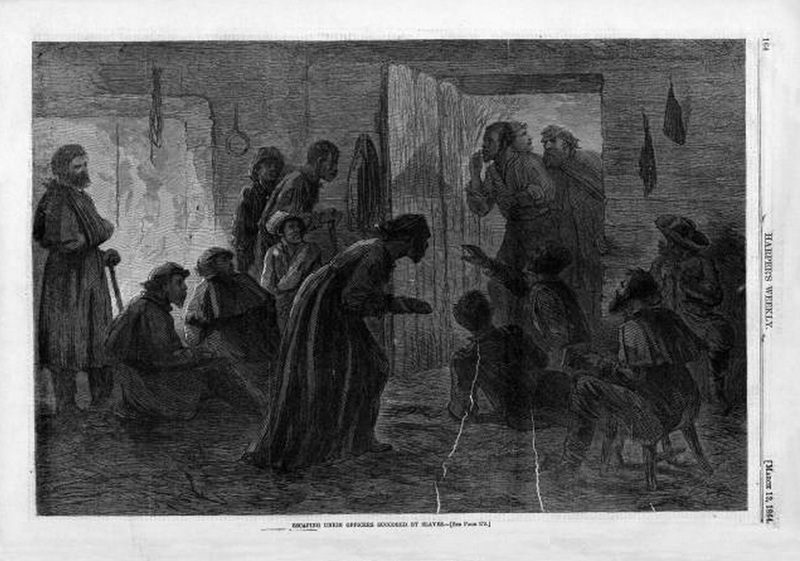 This cartoon, pictured above, depicts African American soldiers in the American Civil War. Drawn in the Southerner perspective, the cartoon plays on humor and the ridiculousness of African American soldiers fighting in the war. Ultimately the cartoon argued that African American soldiers make as good of soldiers as whites. 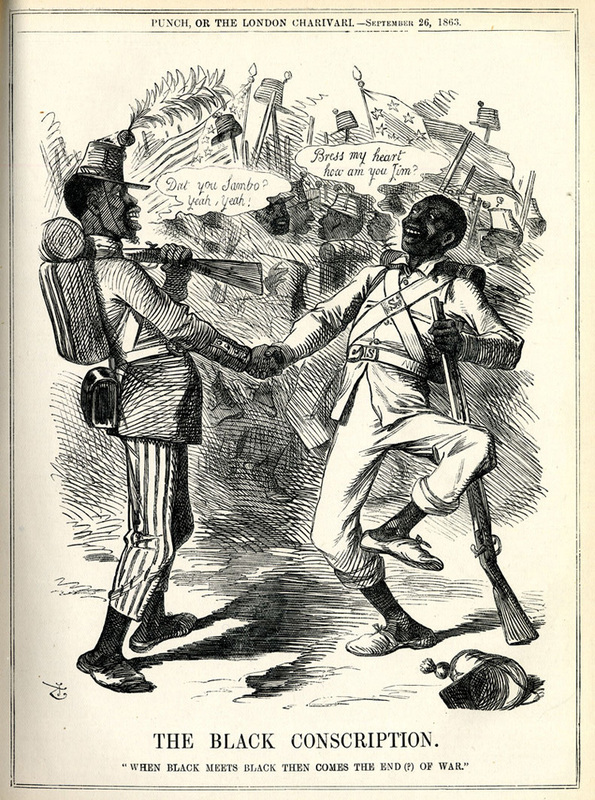 The cartoon exaggerates various characteristics of the two African Americans depicted, hinting that they were not fit to be soldiers. In this article, a writer for Harper’s Weekly, a New York political magazine, described the liberation of black soldiers under the command of General Edward A. Wild. 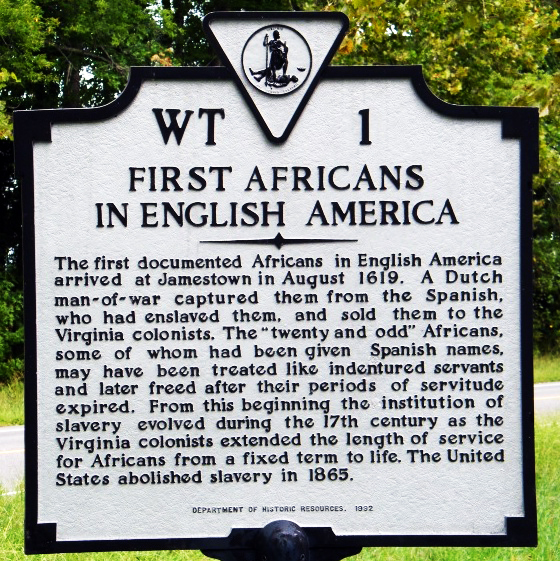 These soldiers ultimately helped to free hundreds of enslaved Africans and settle them on Roanoke Island. The specific article of concern in this paper is entitled “Escaping Union Officers Succored By Slaves” and it discussed an episode where “negroes” helped and protected Union officers escape from a prison in Richmond, Virginia. The article went on to declare that the African American’s were helping the Union during the Civil War. 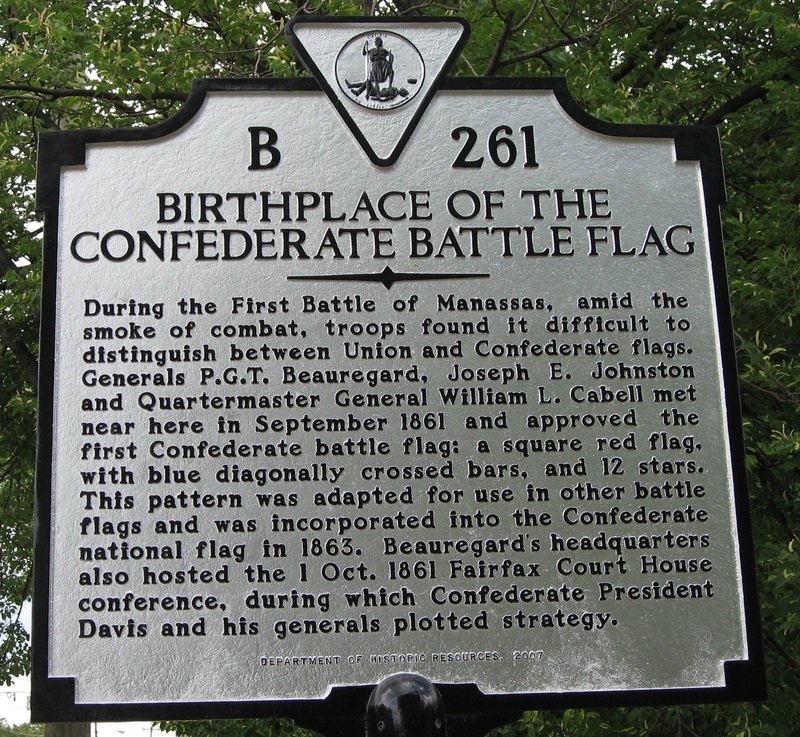 One example that the article cited was the First North Carolina and Fifty-fourth Massachusetts fighting in the Battle of Olustee with “unflinching bravery and perfect coolness.” Both of these regiments were colored and the First North Carolina Volunteers, which would become the 35th United States Colored Troops, was comprised of mainly former slaves from North Carolina that enlisted in the Union army in New Bern during the Union occupation of the coast. The battle of Olustee was one of the few battles that the men of the 35th USCT would fight in, though records prove that they fought bravely.